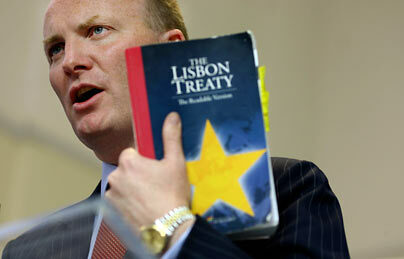 Declan Ganley is almost the only Irish political figure offering a long term vision for Europe. Ganley: Like him or not, he is one of the few to talk ideas. I have been a critic of Declan Ganley in the past, and disagree with him on other issues. But he has to be given credit for the fact that he, with the exception maybe of John Bruton, is one of the few active political figures in Ireland who openly outlines a clear vision of what he wants Europe to look like. Neither Eamon Gilmore, Enda Kenny, Gerry Adams or Micheal Martin share their visions of a future Europe in any detail, other than to rely on trite and empty statements about Ireland’s national interests. Listening to both him and Lucinda Creighton discussing the future of Europe recently on Newstalk, he was talking about the treaty AFTER this one, something our full time political leaders give the impression they have not even begun to consider, despite the fact that the German Foreign minister has. Having said that, Lucinda should be given some leeway, as she does seem to be considering these issues too, but is restrained by her position. Her bosses should start considering them as well, and talking about them in public. You can’t say nothing about the possibility of a federal Europe until its sudden arrival, and then expect to pass it in a referendum.